Check out the highlights from the UFC on ESPN+ 7: Overeem vs. Oleinik main card in St. Petersburg, Russia. Alistair Overeem once again bolstered his moniker “The Demolition Man” by finishing friend and former training partner Aleksei Oleinik in the first round. Following UFC on ESPN+ 7 in St. Petersburg, Russia, the Ultimate Fighting Championship heads to Sunrise, Florida, for UFC on ESPN+ 8. The event is highlighted by a middleweight showdown between top contenders Ronaldo “Jacare” Souza and Jack Hermansson on Saturday, April 27. On Saturday. Overeem faced local favorite Aleksei Oleinik in the main event at UFC Fight Night from Saint Petersburg, Russia, which was actually his third appearance competing in the country during his storied fight career. While Oleinik accepted the fight on short notice after Overeem’s original opponent Alexander Volkov fell off the card, he still make a strong showing for himself even in defeat. Known best for his suffocating submission game, Oleinik almost immediately pulled guard when the fight started as he looked to apply one of his infamous Ezekiel chokes but Overeem was wise to the strategy before working his way back to the feet. Recognized as one of the most accomplished strikers in MMA history as a former K-1 Grand Prix champion, Overeem showed power and patience while facing some truly wild attacks from Oleinik on the feet. Time after time, Oleinik would just dive forward while throwing a massive overhand right and he appeared to clip Overeem early in the opening round, sending him backwards against the cage. Oleinik followed up with a barrage of punches but as Overeem covered up it was clear that he wasn’t absorbing any damage but rather allowing his opponent to zap his strength by putting everything into those combinations in an ill-fated attempt to get the finish. When Overeem finally decided to return fire, he blasted Oleinik with huge bombs on the feet while constantly setting up the strikes that would bring an end to the contest. With Oleinik constantly pressuring forward into the clinch, Overeem took advantage by grabbing onto his head and then bringing up a devastating series of knee strikes. After a few glancing shots, Overeem finally began connecting flush and one final knee strike dropped Oleinick to the ground as he fell to his back just trying to survive. Overeem followed up with a series of punches, hammer fists and one final elbow that finally did enough for referee Marc Goddard to step in and stop the fight. The end came at 4:45 into the opening round. Overeem had suffered through a tough stretch in his career just recently after dropping back to back knockout losses to Francis Ngannou and Curtis Blaydes but a change in training camps and a move to Denver have rejuvenated the former UFC title contender. Now Overeem has rattled off two wins in a row, both by TKO, and he’s looking forward to keeping that momentum going with a potential matchup against the main he was supposed to face on Saturday in Russia. Conor McGregor got back into the ring on Friday but not for his return to mixed martial arts. Instead the Irish superstar participated in an exhibition boxing match at his old stomping ground in the Crumlin Boxing Club near Dublin in his native Ireland. The match took place as part of the boxing club’s annual ‘Good Friday Show’, which featured 14 bouts during the Easter weekend card. McGregor was not advertised for the card but instead the name ‘A. Another’ was listed on the bout sheet ahead of the show. McGregor ultimately fought Michael McGraine to a draw after they exchanged punches in front of the raucous crowd inside the famed boxing club in Ireland. McGregor had just recently stopped by the gym to do some work, which is where his combat sports career began before he transitioned to mixed martial arts and became the biggest draw in the history of the sport. McGregor’s fighting future had been in question after he abruptly announced his retirement from the sport several weeks ago but then recanted that statement as he continued talks with the UFC over his next bout. UFC president Dana White said just recently that he plans on meeting with McGregor in Miami to discuss his return to action after his last fight this past October ended with a fourth round rear naked choke loss to current lightweight champion Khabib Nurmagomedov. As of now there’s still no word when McGregor may return to the Octagon but he at least brushed up on his boxing skills in his special exhibition bout on Friday. The UFC did not release any gate revenue figures, but announced UFC Fight Night: Overeem vs. Oleinik a sellout with attendance of 7,326. It was the UFC’s first event in Saint Petersburg, but its second in Russia. The UFC’s first event was in Moscow late last year. UFC Fight Night: Hunt vs. Oleinik also featured Aleksei Oleinik in the main event, where he submitted Mark Hunt in front of a crowd of 22,603 at Olimpiyskiy Stadium. The Russian fighter didn’t fair as well in Saint Petersburg. His friend and former training partner Alistair Overeem riddled him with powerful knees from the clinch before finishing him with several brutal punches at the 4:45 mark of the first round in their main event. The 41-year-old is now forced to go back to the drawing board and re-evaluate his career. Overeem, meanwhile, has now won back-to-back bouts and is looking to notch a third and continue his pursuit of the UFC heavyweight championship. He is hoping to land a fight with Alexander Volkov, whom he was initially scheduled to face in Saint Petersburg before the Russian had to withdraw from the fight. The UFC on ESPN+ 7 fight card from St. Petersburg, Russia, on Saturday may have flown under the radar for many fans, but the fighters delivered strong performances that made the selection of post-fight honors a difficult task. MMA pioneer Alistair Overeem delivered another strong performance with his main-event TKO stoppage of friend and former training partner Aleksei Oleinik, but it wasn’t enough to earn him a post-fight bonus. The Fight of the Night honors went to the co-main event with Islam Makhachev and Arman Tsarukyan each earning an additional $50,000 for their efforts. Makhachev and Tsarukyan put on a high-level grappling display, but Makhachev’s takedowns put him ahead on all three scorecards, so he got the victory as well as a bonus. Though there were numerous outstanding finishes to choose from, the Performance of the Night honors went to two fighters who scored the fastest knockouts of the night. Magomed Mustafaev opened the event with a blistering 44-second knockout of Rafael Fisiev, whom he knocked down not once, but three times before the fight was stopped. Sergei Pavlovich took only a few seconds longer to knock out Marcelo Golm on the main card, finishing the Brazilian fighter in 66 seconds. Like Makhachev and Tsarukyan, Mustafaev and Pavlovich each went home with an additional $50,000 on top of their contracted purses. In his case after suffering back-to-back losses by knockout, Overeem has bounced back with a pair of first round TKO’s against Sergei Pavlovich and Aleksei Oleinik. Because Overeem has competed for the UFC heavyweight title in the past, his name is always going to be mentioned in that race so long as he’s staying competitiove with the best fighters in the world. So it should be no surprise that two wins in a row have once again landed Overeem in that conversation but as much as he hopes to become champion one day, he’s pumping the brakes on those kinds of questions right now. While he has a targeted timeline for his return, Overeem isn’t concerned about the title shot for now anyways. The back-to-back knockouts have maintained Overeem’s ranking in the division where he’s currently No. 7 in the world according to the UFC and there are a string of potential rematches with fighters currently ahead of him. While the only fight he’s not interested in taking would be a second fight against current teammate Curtis Blaydes, anybody else is fair game according to Overeem but he would like the chance to face the fighter he was supposed to meet in Russia this weekend. “There’s not choice in the UFC. I mean you choose who you fight? That’s not how the UFC works. The UFC will match you with whoever is interesting and that’s based on rankings,” Overeem explained. Volkov was forced out of the main event for the card just over two weeks ago and it appears Overeem would like the chance to settle that bit of business for a third win in a row and then he’ll address his hunt for the title again. Nurmagomedov, who is currently serving out a nine month suspension for a post fight brawl after his last bout against McGregor, watched Poirier become the interim UFC lightweight champion this past weekend with a unanimous decision victory over Max Holloway. While it was a battle throughout all five rounds, Poirier still gutted out the win and even Nurmagomedov had to admit he was surprised by how it all unfolded. “I think it was a very good performance from Dustin Poirier,” Nurmagomedov told the ESPN+ post fight show at UFC Fight Night in Saint Petersburg, Russia. “Honestly before the fight, I thought Holloway was going to beat him. This was my prediction when we talk with friends, with father, with team, but he impressed me. Dustin has impressed me. I think he has very good boxing, much better than before. Every fight he becomes stronger, better in boxing on his feet. I think he deserves title shot. While there won’t be much trash talking between the two fighters as Nurmagomedov and Poirier have already shown each other a lot of respect ahead of their eventual showdown, that won’t stop the undefeated Russian from doing what he does best. Nurmagomedov has been a punishing force of nature in virtually every fight he’s had in the UFC and he has no plans of stopping when he meets Poirier later this year. “A long time I follow him, he has a very good background, he has a very good ground game, not bad. He has a good striking game. I follow him a long time and versus me, I think I have to maul him like I do with everybody,” Nurmagomedov said. This is what I have to do. 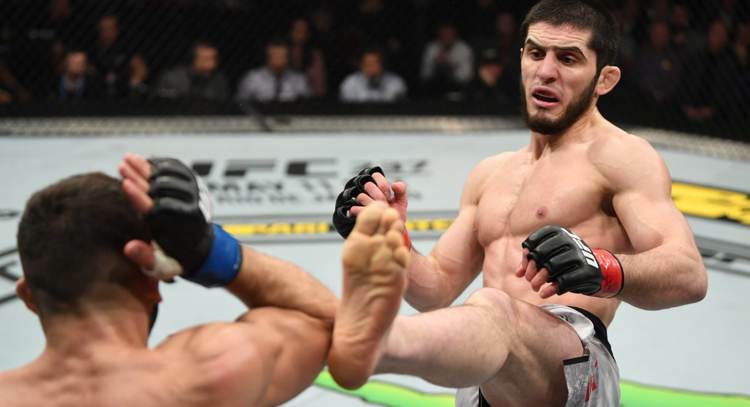 As far as timing goes, Nurmagomedov has been steadfast with a targeted return date in September after his suspension is lifted and after he observes Ramadan in the early summer in May and June. After that, Nurmagomedov will be ready to get back to business with Poirier already set as his next opponent. The Ultimate Fighting Championship returns to Russia this week for a heavyweight showdown that could determine who remains as one of the contenders to current UFC heavyweight champion Daniel Cormier. UFC on ESPN+ 7: Overeem vs. Oleinik is topped by a heavyweight battle between friends and former training partners Alistair Overeem and Aleksei Oleinik. Though Overeem (44-17, 1NC) dropped back-to-back bouts to Francis Ngannou and Curtis Blaydes before rebounding with knockout victory over Sergey Pavlovich, a victory over Oleinik would keep his name etched at the top of the division. Overeem has been at or near the top of the heavyweight class for the better part of two decades, but at 38 years of age, he’s not done just yet. Oleinik has flown somewhat under the radar for much of his career, but at 41, he has amassed a 57-11-1 record over his nearly 23-year career. Perhaps most impressive is the fact that he has submitted 45 of the 57 opponents he has defeated. Overeem, however, has only been submitted one time in his career, that being a Kimura submission loss to former UFC heavyweight champion Fabricio Werdum 13 years ago. Oleinik has also admitted that he was unable to submit Overeem when they trained together. It’s a bout that harkens back to the days of the grappler vs. the striker, promising one of the more interesting heavyweight match-ups that we’ve seen in some time. The card also features the first UFC women’s bout in Russia, as Roxanne Modafferi squares off with Antonina Shevchenko in a flyweight contest. Modafferi (22-15) is a pioneer of mixed martial arts having fought nearly as long as Overeem and Oleinik. At 36 years of age, she’s just hitting her stride. Though her overall Octagon record is just 3-3, Modafferi has added a depth of striking to her game that had been lacking in the past. She remains one of the toughest challenges on the women’s side of the sport and appears at home in the flyweight division. Though Shevchenko is nearly the same age – she’s 34 – her depth is at kickboxing, where she has spent years fighting at the championship level. She is only seven fights into her MMA career, but has won all seven bouts including a victory over Jaymee Nievara on Dana White’s Contender Series and a win against Ji Yeon Kim on The Ultimate Fighter 28 Finale fight card. Modaferri will be a true measuring stick of where Shevchenko stands in the division that is currently topped by her sister, Valentina. Oddsmakers at MMAWeekly.com odds partner MyBookie on Friday, Overeem is the heavy favorite to take the victory in the main event. MyBookie has him at -240, while Oleinik is +200. 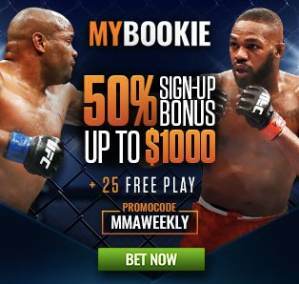 If you’d like to take a closer look at the UFC on ESPN+ 7 betting lines and prop bets or any of the other MyBookie odds, be sure to use the promo code MMAWEEKLY if you sign up to get your 50-percent sign-up bonus. Former UFC fighter and current Combate Americas athlete Angela Magana awoke from a coma that stemmed from a surgical procedure earlier this week in Puerto Rico. Members of Magana’s team revealed here coma on Tuesday. She required surgery following severe back pain that ultimately forced her out of her upcoming Combate Americas debut on April 26. Magana began to come out of the coma on Thursday, with her team updating her status on Twitter. NOTE: Angela is awake very drowsy making jokes like herself. Shes made a couple videos when she is more coherent she can post.She wants to thank everyone who has wished her well. Magana began posting on Friday, tweeting that she had a video uploaded to Youtube. It was a very emotional video, in which Magana stated that she is looking forward to a quick and full recovery despite the complications. TMZ Sports often gets credit for being an instigator with many of its interviews. When the outlet recently asked Jon Jones about who he saw himself fighting now that he’s back in the UFC swing of things, Jones mentioned that he thought he and Israel Adesanya would eventually fight. That triggered a few weeks of jawwing back and forth on social media and in interviews between Jones and Adesanya. When that feud hit a fever pitch, UFC veteran Brendan Schaub addressed it on Joe Rogan’s podcast, claiming that TMZ instigated the feud and insinuated that race was involved in TMZ’s motives. Rogan noted that what Jones had said initially wasn’t disrespectful, he simply stated that he felt one day he and Adesanya would probably end up fighting. But Schaub felt when TMZ then asked Adesanya about it that they were out of place. “Stylebender, TMZ asked him, they don’t know s–t about fighting. This guy’s big, this guy’s big, they’re both black, let’s fight. They have no idea. That’s what they think,” Schaub said. During Tyron Woodley’s weekly show on TMZ, The Hollywood Beatdown, he discussed the matter with co-host Evan Peters, who was the one to ask Jones the initial question.